This website has been set up by a group of Equitable Life members as a non profit making, non commercial enterprise for the good of all those associated with the Equitable Life Assurance Society, so that we can get together to ensure the best possible results for our futures. 16 June 2018 Equitable Life has agreed a sale to fellow mutual insurer the Life Company Consolidation Group (LCCG). Under the terms of the deal around £1.8bn in capital will be returned to Equitable Life’s 300,000 policyholders. This equates to an average £6,000 payout to each person. The two companies said this represented a 35pc increase in capital distribution for each policyholder. The sale is expected to complete by the end of 2019, which would trigger the payouts. Completion is subject to regulatory and court approval. Members will vote midway through 2019. Equitable Life and its remaining £6.3bn of assets will be rolled into LCCG’s Reliance Life business. LCCG plans to convert Equitable Life’s “with profits” policies to “unit linked” funds. The Treasury has announced that as of 30th June 2014, the Scheme has issued payments totalling £972.9 million to 877,414 policyholders. The Scheme has published a further progress report, which can be found at https://www.gov.uk/government/publications/equitable-life-payment-scheme-july-2014-progress-report. If you feel you have not been fairly included, here is how to contact your MP. You can contact us on info@equitablelifemembers.org.uk. 14 November 2013 EMAG AGM Birmingham. 15 November 2012 EMAG AGM Birmingham. 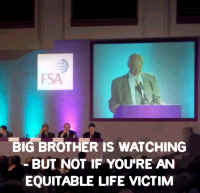 7 September 2012 Did Anyone Learn Anything from Equitable Life? What is your likely retirement income going to be? To track a lost pension, go to www.thepensionservice.gov.uk for an online form, call 0845 6002 537 (8am to 8pm, Mon to Fri) or write to: Pension Tracing Service, The Pension Service, Future Pension Centre, Room TB 201, Tyneview Park, Newcastle upon Tyne, NE98 1BA. 27 June '08 - EMAG Goes Regional! EMAG has set up a network of regional cells in anticipation that the Parliamentary Ombudsman may recommend compensation when her report is finally published in mid-July. Visit the new website at www.emagregional.org.uk and see how to participate in the campaign in your local area. Even if you’re already an EMAG member, logging your details on your regional site will enable you to stay in touch with action in your area - or join the regional team to help promote the campaign for compensation which is certain to intensify in the coming weeks and months. Read more. 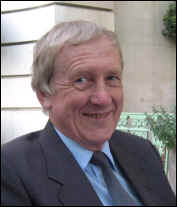 Pictured to the left is Chris Harlow who has done a sterling job in organising the regional network. NB See Equitable Life's site for current comments and information. Also more information can be found on the Halifax Equitable Site. Equitable had little effective scrutiny and was "a self-perpetuating oligarchy amenable to policyholder pressure only at its discretion". The Equitable Life Members Support Group is not authorised to give individual financial advice. This web site attempts to point policyholders towards sources of information. We cannot take responsibility for any incorrect information given there. All information provided on this website is in good faith and has been checked as far as possible as to its correctness. We sometimes point to reports and letters written by individual policyholders, this does not mean that we are necessarily in agreement with what is written, but this allows for debate on the subject.